Although increased extracellular matrix (ECM) is pathogenic in a variety of chronic tissue injuries, reduced and/or disrupted ECM may be detrimental in atherosclerosis and rather destabilize existing atherosclerotic lesions. This study therefore assessed the effects of angiotensin II (AngII) antagonism on ECM components of advanced atherosclerosis. Twenty-four-week-old apolipoprotein E–deficient mice were treated with the AngII antagonist losartan for 12 wk. Controls received water or hydralazine. AngII antagonism significantly reduced progression of established atherosclerosis, whereas hydralazine showed no benefit despite similar decrease in BP. Although there was no difference in the macrophage component, AngII antagonism increased the relative collagen portion of the lesions; lessened elastin fragmentation, increased the total elastin content of the aorta; and reduced the mRNA and activity/protein of the elastolytic proteases, cathepsin S, and metalloproteinase-9. Extracellular elastin degradation by cultured smooth muscle cells (SMC) was reduced by losartan, as was SMC invasion through an elastin gel barrier. Thus, AngII antagonism lessens progression of atherosclerosis, increases collagen, and preserves elastin components of ECM within the vascular lesions, which, at least in part, is modulated by effects on SMC. These effects not only decrease further expansion of advanced lesions but also stabilize the established atherosclerotic plaques and may underlie the decreased incidence of acute cardiovascular events that are observed in patients in whom AngII antagonism is begun after atherosclerosis is already established. Observations that increased ECM is beneficial in atherosclerosis stand in stark contrast with nonatherogenic progressive arteriosclerotic and fibrotic disorders, including CKD, in which ECM accumulation is detrimental. Chief among the interventions to decrease ECM accumulation is antagonism of angiotensin II (AngII), which has become the therapeutic mainstay for a variety of progressive cardiovascular and renal scarring diseases.12 It is interesting that AngII antagonism is now also promoted as an effective intervention in preventing the acute clinical sequelae of atherosclerosis, although the mechanisms for such benefits remain largely unknown.13–16 In this connection, our recent study in a mouse model of atherosclerosis and reduced renal mass found that AngII antagonism with losartan between 12 and 24 wk reduced development of atherosclerosis,17 complementing previous results of AngII inhibition that is begun at the early stages of experimental atherogenesis in animals with intact kidneys.18–24 The losartan-linked decrease in atherosclerotic disease at this early stage was associated with reduction in macrophage migration and intimal infiltration as well as reduction in elastin disruption and vascular cathepsin S. On the basis of these results, we proposed that AngII antagonism lessens early atherogenesis by limiting macrophage infiltration and squelching macrophage synthesis of the elastolytic enzyme cathepsin S. However, the cellular and ECM composition of atherosclerotic lesions changes as disease progresses, with waning of macrophages.25,26 It is not known whether or by what mechanisms AngII antagonism may benefit the clinically relevant later stages of atherosclerotic vascular remodeling. Such considerations seem especially pertinent because AngII antagonism is usually initiated in patients, including those with CKD, well after atherosclerotic lesions are established. We therefore aimed to determine whether AngII antagonism can modify the later stages of atherosclerotic disease to elucidate mechanisms of the seemingly paradoxic effects of AngII antagonism to enhance ECM components in established atherosclerotic lesions. Table 1 shows whole-body parameters in control mice that were killed at age 24 or 36 wk, 24-wk-old mice that were treated with losartan for 12 wk, and 24-wk-old mice that were treated with hydralazine for 12 wk. Before treatment, there were no differences in BP. Right before the mice were killed, BP was lower in losartan-treated versus control mice but similar between hydralazine- and losartan-treated groups. Body weights and serum triglycerides were not different among the groups, whereas serum cholesterol was lower in hydralazine-treated than in control or losartan-treated mice. Extent of atherosclerotic lesions in the proximal and en face aortas increased over time in untreated apolipoprotein E–deficient (apoE−/−) controls (Table 1, Figure 1). Losartan significantly decreased the extent of the lesions both in cross-sectional proximal aortas and in en face assessments. By contrast, hydralazine did not lessen the extent of atherosclerosis as assessed by either method. Whereas the number of individual lesions increased between 24 and 36 wk of age in untreated mice, this measure was unaffected by treatment with losartan or hydralazine. (A) Cross-sectional aortic lesions. Cryosections of proximal aortas stained with Oil-Red-O and counterstained with hematoxylin in control apoE−/− (C24w, C36w) and apoE−/− mice that were treated with losartan (L) or hydralazine (H) from 24 to 36 wk. (B) En face aortic lesions. Representative pictures of pinned-open aortas stained with Sudan IV from controls and L- and H-treated apoE−/− mice. Graphs in A and B show quantitative data in controls (□; C24w, n = 5; C36w, n = 10), H-treated mice (□; n = 5), and L-treated mice (▪; n = 10) from 24 to 36 wk. Macrophage content as assessed by monoclonal rat antibody to mouse macrophage (MOMA-2) staining revealed that, as the atherosclerotic lesion expanded, the proportion that was macrophage positive decreased. MOMA-2 staining occupied 31.0 ± 4.0% of lesions in mice that were killed at 24 wk and 12.5 ± 2.0% of lesions in 36-wk-old mice. The macrophage content was not affected by treatments (12.5 ± 4.0% MOMA-2 staining in losartan-treated mice and 14.0 ± 4.3% in hydralazine-treated mice at 36 wk). The relative collagen proportion of lesions as assessed by Masson trichrome staining in untreated control mice was not significantly affected (16.2 ± 3.2% at 24 wk versus 21.1 ± 3.8% at 36 wk; NS; Figure 2). However, losartan-treated mice showed a significant increase in the proportion of lesions that were occupied by collagen (37.3 ± 3.2 versus 21.1 ± 3.8% in 36-wk-old untreated mice; P = 0.028). By contrast, hydralazine did not affect the proportion of the lesion that was occupied by collagen (21.0 ± 4.1% versus untreated controls at 36 wk; NS; Figure 2). Because losartan also decreased the Oil-Red-O lipid staining component of this ratio, we applied another method to assess collagen. HPLC analysis revealed no difference in the collagen content between losartan-treated and control aortas (11.4 ± 4.3 ng/mg aortic tissue versus 9.0 ± 1.0, respectively; NS). These findings indicate that although losartan treatment did not increase the absolute quantity of collagen within the vessel wall, it did increase the proportion of the wall lesion that was occupied by collagen (Masson trichrome). Aortic collagen. Collagen-positive area calculated using computer-assisted image analysis of Masson trichrome staining and expressed as percentage of Oil-Red-O–stained atherosclerotic lesion in controls (□; C24w, n = 5; C36w, n = 10), H-treated mice (□; n = 5), and L-treated mice (▪; n = 10) from 24 to 36 wk. By contrast, another important component of ECM, elastin, was profoundly affected by atherosclerosis and by losartan but not hydralazine treatment. 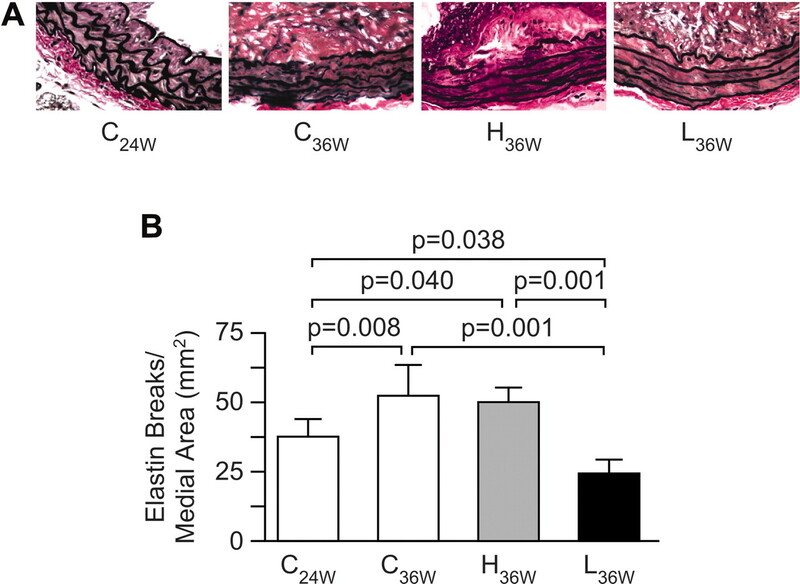 Progression of atherosclerosis in untreated mice was associated with greater disruption of elastin lamellae: At 24 wk there were 38.0 ± 6.0 versus 52.7 ± 11.0 breaks/mm2 at 36 wk in untreated controls (P < 0.008). Elastin breaks were remarkably lessened by losartan but not by hydralazine (losartan: 24.7 ± 2.5 versus controls [P < 0.0001]; hydralazine: 50.1 ± 6.3 versus controls [NS]; Figure 3). Notably, the number of elastin breaks in losartan-treated mice that were killed at 36 wk was even less than in 24-wk-old controls, suggesting that losartan not only protects against destruction of elastin but also may even promote reconstitution of elastin fibers. Desmosine, a marker of mature elastin, was also significantly higher in aortas of losartan-treated mice versus untreated controls (10.9 ± 1.0 versus 5.9 ± 1.1 ng/mg, respectively; P = 0.034). (A) Aortic Verhoeff-van Gieson staining for elastin. (B) Elastin breaks assessed from controls at 24 (n = 5) and 36 wk (n = 10; □) and mice that were treated with H (□; n = 5) or L (▪; n = 10) from 24 to 36 wk. Because atherosclerotic disruption of elastin of the normal vascular architecture involves matrix metalloproteinases (MMP) and cathepsins, we compared key elastolytic systems in aortas from control and losartan-treated mice. Immunostaining for cathepsin S was decreased by losartan but not hydralazine treatment. 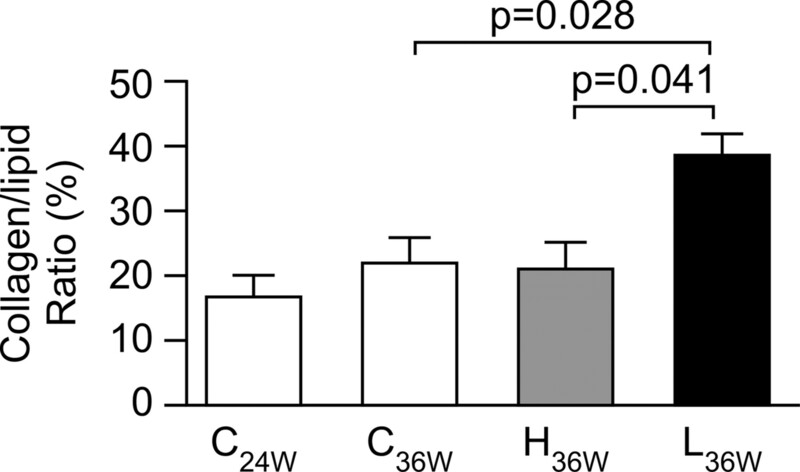 The reduction in cathepsin S protein paralleled a decrease in the mRNA expression, which was halved in aortas of losartan-treated versus control mice (P = 0.036) but not in hydralazine-treated mice (NS versus controls). Losartan-treated but not hydralazine-treated mice, showed decreased aortic MMP-9 mRNA expression versus controls (34.1 ± 11.0% of control expression levels found in losartan-treated [P = 0.03] and 88.1 ± 16.0% in hydralazine-treated mice [NS] versus controls; Figure 4). There was no significant difference in the mRNA expression for MMP-2 among the groups. MMP-9 activity was also reduced in aortas of losartan-treated mice but not in hydralazine-treated mice versus controls (zymographic relative density in control 264,422 ± 12,163 versus losartan 197,183 ± 13,398 [P < 0.05] and control 248,415 ± 22,052 versus untreated controls [NS]; Figure 4). There was no difference in the activity for MMP-2 among the groups. The elastolytic capacity of cultured vascular smooth muscle cells (VSMC) was increased in response to AngII (27.0 ± 2.4 versus 4.7 ± 1.9 cpm × 104/106 cells per 24 h in control cells; P = 0.003; Figure 5). This AngII-induced increase in elastolysis was significantly attenuated by losartan (14.6 ± 4.2 cpm × 104/106 cells per 24 h; P = 0.035 versus AngII, NS versus controls). These in vitro studies were complemented by observations of increased elastolysis in mice that received an infusion of exogenous AngII (65.1 ± 7.0% more elastin breaks versus saline; P = 0.008). AngII-induced increase in SMC invasion was also dramatically inhibited by losartan (P < 0.01 versus AngII); inhibitors of cathepsin S, including the selective cathepsin S inhibitor (morpholinurea-lucine-homophenylalanine-vinyl phenyl sulfone (LHVS), P < 0.001 versus AngII); endogenous cysteine inhibitor cystatin C (P = 0.001 versus AngII); and inhibitor of MMP (GM6001; P < 0.001 versus AngII; Figure 6). 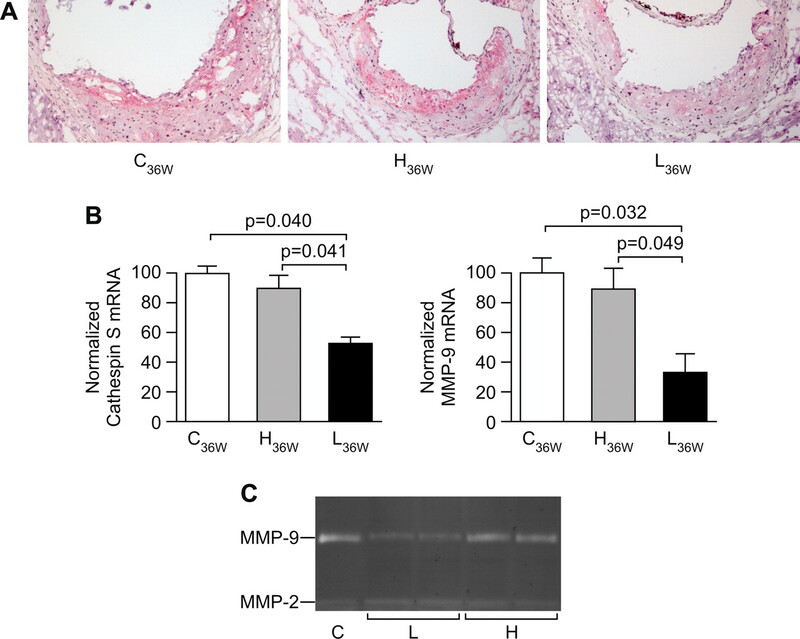 (A) Immunohistochemical staining for cathepsin S in aortas of controls (C) and mice that were treated with L or H. (B) mRNA expression for cathepsin S and matrix metalloproteinase-9 (MMP-9) in C (□; n = 5) and mice that were treated with L (▪; n = 5) or H (□; n = 5). (C) Gelatin zymography for MMP-9 and MMP-2 levels in aortas of untreated C (n = 5) and mice that were treated with L (n = 5) or H (n = 5). 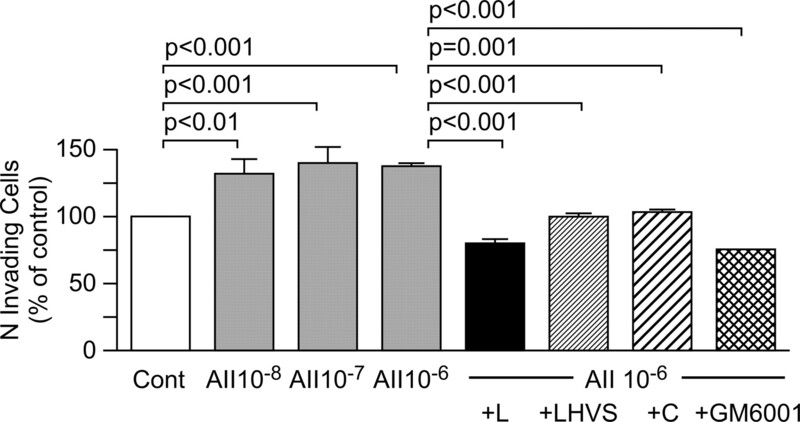 Elastolytic capacity of cultured vascular smooth muscle cells increased in response to exposure to angiotensin (AngII) and was abrogated in cells exposed to AngII + L.
Transelastin gel invasion increased in cultured vascular smooth muscle cells exposed to AngII (10−6 and 10−8 M) and the abrogated effects of AngII (10−6 M) in the presence or absence of L, selective cathepsin S inhibitor (LHVS), endogenous cysteine inhibitor, cystatin C (C), or metalloproteinase inhibitor (GM6001). The characteristics of atherosclerotic vascular remodeling change as lesions evolve. Our data reiterate that as atherosclerosis progresses, the macrophage component decreases, and at 36 wk of age, the lesional component that is macrophage positive is only approximately 12%. Contrasting previous reports of earlier stages of atherosclerosis,21,22 this study finds no difference in the macrophage-positive proportion of established atherosclerotic lesions between control and losartan-treated mice. Therefore, as lesions mature and the macrophage proportion of the lesion wanes, both the progression of disease and the impact of therapeutic interventions reflect distinct mechanisms that include contributions of nonmacrophage components of the lesion. In addition to collagen, we examined the vascular ECM protein elastin, which was recently shown to be a crucial modulator of vascular remodeling and expansion.7 We found increased disruption of elastin lamellae as atherosclerosis progressed, as previously reported.7,9,12 Although we previously observed elastin disruption in early stages of atherogenesis,17,38 the results of this study indicate that this process not only continues into the later stages of the disease but also can be limited with AngII antagonism even in advanced disease. Losartan not only lessened the progressive increase in elastin breaks but also seems to have promoted elastin reconstitution because there were significantly fewer breaks at the end of losartan treatment than at the beginning of the therapy. Furthermore, desmosine, a marker of mature elastin, showed higher levels in aortas of losartan-treated versus control mice. The dampening of elastolytic capacity of VSMC that were exposed to AngII by losartan may have contributed to this effect. It is interesting that AngII antagonism prevented an increase in serum and aortic elastolytic activity in cholesterol-fed rabbits and ameliorated arterial internal lamina ruptures in Brown Norway rats.34,39 Although elastin per se has been identified as a pivotal modulator of vascular response to injury, previous studies focused on macrophage-related elastolytic proteases.40,41 This study makes the novel observations that AngII increases elastolysis by SMC in vitro and elastin breaks in the aortic media in vivo, although a contribution from macrophages and/or endothelial cells cannot be completely excluded. Our results also show that AngII antagonism prevents disruption of elastin and may even promote reconstitution of elastin through mechanisms that, at least in part, include modulation of the elastolytic capacity of VSMC. Elastin degradation has been most closely linked to MMP-2 and -9 and to cysteine proteases, especially cathepsin S.7,40–43 We found that AngII antagonism lessens cathepsin S and MMP-9 but not MMP-2 mRNA and activity. Recent observations indicate an especially relevant role for MMP-9 in extension and disruption of advanced plaques,43–45 including the pertinent finding that MMP-9 derived from resident vascular cells and not bone marrow–derived infiltrating cells was required to accelerate disease. Furthermore, MMP-9, cathepsin B, and a potential activator of both, legumin, were increased in unstable atherosclerotic plaques in humans.46 We further showed that inhibition of MMP, cathepsin, or AngII blocked the AngII-mediated invasion by SMC through an elastin gel barrier. These findings complement previous observations that proteases from SMC promote matrix destruction, cellular migration, and inflammation, specifically implicating co-localization of proteases, such as cathepsin S and MMP-9, with integrin αvβ3 on SMC.47 Thus, this study reveals that at later stages of atherosclerosis, SMC can modulate proteolysis that promotes disruption of the elastin component of the vascular ECM and that AngII inhibition lessens the proteolytic effects in SMC. This observation may be particularly relevant to patients with CKD because even modest renal dysfunction imparts an independent risk for cardiovascular disease and death.9–12 Acute cardiovascular events typically reflect destabilization of the atherosclerotic plaques. Therefore, initiation of AngII antagonism at any stage of atherosclerosis not only may lessen progression of the atherosclerotic lesions but also may modulate the plaque characteristics toward a less vulnerable phenotype. All experiments were done in female (apoE−/−) mice on C57BL/6 background (Jackson Laboratories, Bar Harbor, ME), maintained on normal mouse chow (RP5015; PMI Feeds, St. Louis, MO). Care and experimental procedures were in accordance with National Institutes of Health and Vanderbilt University Institutional Animal Care and Usage guidelines. Angiotensin receptor antagonist losartan (n = 25; 100 mg/L drinking water) or hydralazine (n = 10; 80 mg/L drinking water) was begun at 24 wk of age and continued for 12 wk until the end of study at 36 wk of age. Dosages used in this study were based on pilot data in apoE−/− mice (n = 15), in which BP was determined two to three times per week and hydralazine and losartan dosages were titrated until similar reduction in BP was achieved. Age-matched controls received water and were killed at age 24 and 36 wk (n = 10 at each time point). Additional mice received infusions of AngII (1000 ng/kg per min for 2 wk delivered through a subcutaneously implanted osmotic minipump; model 1002 [Durect, Cupertino, CA]; n = 5) or saline (n = 4) and aortas were assessed for elastin breaks as described next. Systemic BP was determined by Muramachi Systems (Model MK-2000; Osaka, Japan) automated tail cuff in all mice in a conscious state after they were acclimated to the procedure, with mean values based on an average of three stable readings.17 BP was assessed at baseline before treatment, then at weekly intervals until the BP stabilized, and again before being killed. Serum cholesterol and triglyceride levels were determined at the end of the experiment. Mice were killed under phenobarbital anesthesia, and tissue was harvested for assessment (50 mg/kg). The heart, together with the proximal aorta, was embedded in OCT. Cryosections, 10 μm thick, were cut from the proximal aorta beginning at the end of the aortic sinus with modifications specific for computer analysis using Imaging System KS300 (Release 2.0; Kontron Elektronik GmbH, Eching, Germany) on at least 15 sections from each mouse.17,38,48 Cryosections were stained with Oil-Red-O and counterstained with hematoxylin (Sigma, St. Louis, MO). The remaining aortas, from the aortic valves to iliac bifurcation, were dissected, the en face preparations were stained with Sudan IV, and lesions were compared by computerized analysis. Numbers of Sudan IV–positive plaques in en face aortas were assessed by counting. The operator was blinded to group assignment. Monoclonal rat antibody to mouse macrophages, MOMA-2 (Serotec, Raleigh, NC) was used to detect macrophage infiltration. The area stained with MOMA-2 in serial sections was measured using Imaging System KSD300 (Kontron Elektronik) and calculated as the ratio of macrophage-stained to Oil-Red-O–stained areas as described previously.17,38,48 Five-micrometer sections of proximal aortas were stained with Masson trichrome, and the collagen-positive area was expressed as the ratio of Masson trichrome-to-Oil-Red-O–stained areas. Verhoeff-van Gieson elastin staining was performed in samples obtained from along the entire aorta as described previously.17,38 Elastin breaks were defined as interruptions in the elastin fiber, together with reappearance of the fiber, expressed as number of elastin breaks per square millimeter of medial area. Sections stained with the polyclonal cathepsin S antibody (1:100 dilution; Calbiochem, La Jolla, CA) were incubated overnight and subsequently incubated with secondary antibodies (Vector Laboratories, Burlingame, CA) followed by incubation with ABC-AP complex.5,17 In each experiment, negative controls without the primary antibody were included and showed no staining. Aortic collagen content was assessed from the concentration of hydroxyproline and proline, measured as their phenylisothiocyanate derivatives by reverse-phase HPLC. Collagen content is expressed as nanograms per milligrams of aorta. Elastin content was also assessed by reverse-phase HPLC from the concentration of desmosine and expressed as nanograms per milligram of aorta. Gelatin zymograms of aortas were performed as described previously.49 Freshly isolated aortas were pulverized in liquid nitrogen and transferred to lysis buffer (20 mmol/L Tris-HCl [pH 7.4], 150 mmol/L NaCl, 10 mmol/L EDTA, 10 mmol/L benzamidine HCl, 0.02% sodium azide, 0.1% Triton X-100, 0.02% Tween 20, 2 mmol/L PMSF, 0.5 mmol/L leupeptin, and 5 μg/ml aprotinin), and extracts were loaded on 10% SDS-polyacrylamide gels containing gelatin (1 mg/ml) and electrophoresed under nonreducing conditions. Gel proteins were renatured in 50 mmol/L Tris/0.1 mol/L NaCl/2.5% Triton X-100 at room temperature, washed, and then incubated in 50 mmol/L Tris/10 mmol/L CaCl2/0.02% NaN3. Gels were stained with Coomassie blue and destained in 5% acetic acid/10% methanol. The zymograms were digitized, and the size-fractionated banding pattern, which indicates MMP proteolytic activity, was determined by quantitative image analysis. Total RNA extraction was performed using the RNeasy Mini kit (Qiagen, Valencia, CA). Quantifications of murine cathepsin S, MMP-2 and-9, and an endogenous control β-actin and 18S ribosomal RNA levels were performed by a real-time reverse transcriptase–PCR assay (TaqMan) using an ABI prism 7700 sequence detection system (ABI). Probes for cathepsin S, MMP-2, MMP-9, β-actin, and 18S were obtained from Applied Biosystems (Foster City, CA). SMC invasion across an elastin barrier was assessed in a modified Boyden chamber with the membrane covered with Etna-Elastin (15 mg/ml) solution and PDGF-BB as the chemoattractant as described previously.47 SMC, isolated and cultured as described previously, were exposed to AngII (10−6 to 10−8 M) alone or AngII (10−6 M) together with losartan (10−5 M), or AngII with a selective cathepsin S inhibitor (LHVS, 5 nmol/L), a broader spectrum cysteine inhibitor (Cystatin C, 1 μg/ml), and an MMP inhibitor (GM6001; 10 μmol/L) for 24 h. The membrane filters were fixed in methanol and stained with 1% crystal violet. SMC adhering to the lower surface of the membrane that had traversed the elastin barrier were counted under the microscope. Quadruplicate wells were used for each experimental condition, and more than four fields (×40) were counted for each well. Results are expressed as means ± SEM. Statistical difference was assessed by a single-factor variance (ANOVA) followed by unpaired t test with corrections for multiple comparisons as appropriate. Nonparametric data were compared by Mann-Whitney U test. P < 0.05 was considered to be significant. This work was supported in part by National Institutes of Health grants DK44757 (V.K. and A.B.F. ), DK37868 (I.I. ), HL53989 (M.F.L. ), HL65709, and HL57986 (S.F.) and by the Lipid, Lipoprotein and Atherosclerosis Core of the Vanderbilt Mouse Metabolic Phenotyping Center (National Institutes of Health DK59637-01). We acknowledge the expert technical assistance of Cathy Xu and Youmin Zhang.